Most recently within the horror genre the ‘filmed footage’ concept has become far too strained and overused, Oculus is the break in the pattern we've all been waiting for. Deriving from an original short film of director Mike Flanagan’s, the script has been dusted off, re-written to a much higher standard and with a much better cast – giving Oculus the potential to be a horror film that will not only be remembered, but play in the minds of each audience member individually once they have left the cinemas. The story of the film is that of an evil mirror, known as the "Lesser Glass" which has existed for over two centuries, documented on-screen by Karen Gillan’s character, Kaylie. 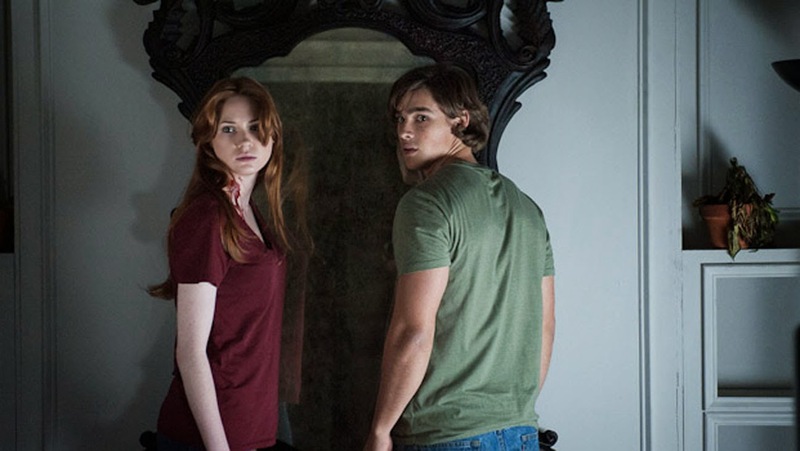 After a childhood incident (shown in segments throughout the film) Kaylie and her brother Tim (played by Maleficent's Brenton Thwaites) make a pact to destroy the mirror. The incident in question is shrouded in mystery, allowing only patches of information to be told at a time. You may ask why not just smash the mirror (or call a Doctor), but we are told it has the ability to protect itself from harm by creating entire mental scenarios that happened differently to how the character (and the viewer) originally perceive. You wouldn't smash an object if your own brother or sister was stood in front of it, would you? Oculus boasts a wonderful cast, not only featuring Doctor Who’s Karen Gillan and Maleficent’s Brenton Thwaites, but also Rory Cochrane (who at first appears to look like an American Danny Dyer). Every actor in Oculus gives a superb performance, even the actors portraying the 10-year old versions of Kaylie and Tim give a convincing performance – especially considering what in reality is running away from a manipulative mirror. Oculus was one of my top films to see in 2014 and it certainly lived upto the expectations I had, I perhaps would argue the ending is rather abrupt but it doesn't impact the overall film in anyway. Oculus is currently in cinemas worldwide. To watch the trailer, click the video below.